The ability to raise and lower your entire desktop at the push of a button or turn of a crank is highly beneficial to your productivity and health, but it can also present a new challenge when it comes to keeping all your cables from becoming an unsightly, tangled mess. 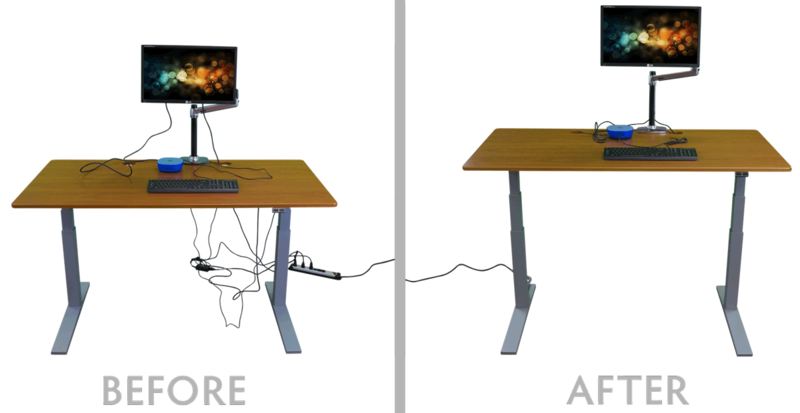 Cables that used to drop behind a fixed-height desk’s rear panel are now visibly out in the open, and all of them need to be sufficiently slack to stay connected to your devices whether the desk is in sitting or standing position. The Advanced Kit comes with all of the contents of the Basic Kit, plus a seven-outlet power strip with built-in surge protector and a convenient twelve-foot-long cord, as well as an inconspicuous, 24”-long cable tray big enough to hold the power strip and all excess cable lengths. All kits are available in both black and grey to blend in with your desk’s base color. The Basic Cable Management Kit has everything you need to get your cables under control. The releasable cable ties and magnetic cable guides can be quickly removed and reused wherever you choose. The adhesive mounting brackets stay in one place, but open and close easily so that you can add or remove wires as needed. The cable sleeve effortlessly wraps your cables into one bundle, protecting them and making it easier to route and guide in the most inconspicuous way possible. While the basic kit will get your workstation tidy, anyone with more than a couple of power cables hanging from the desktop will want to upgrade to the iMovR Advanced Cable Management Kit. The cable trough requires no tools to install, is large enough to fit the included surge protector as well as many other cable bundles, and the adhesive is strong enough to hold over twenty pounds. Plug up to seven power cables into the heavy-duty power strip and place the strip in the cable tray so that your cords move up and down with the desk, eliminating any danger of running out of cable slack as you adjust your desk up. The power strip’s cord is the only one you’ll need to make sure will reach the wall outlet when your desk is at its highest setting, and this one has a twelve foot cord to make sure it can do so without an extension cord. This beefy power strip, with its built-in surge protector, will be hidden from sight instead of cluttering up the floor of your office. What Makes This the Best Cable Management Kit Available? Other desk manufacturers and ergonomics dealers offer less expensive cable management kits that include very small adhesive clips that don’t stick well to the desktop, and don’t have the weight rating of the mounting brackets included in this kit. Their power strips, if supplied, lack an all-important surge protector, and often have fewer outlets. Their cable sleeves, if included, may require special tools (easy to lose) or are too short for the reach of a modern height-adjustable desk. Their components are usually designed for one-time installation, when in reality most people add and subtract devices from their desks all the time. Having a kit that can adapt to those changes is really helpful. Lastly, they don’t include supermagnet cable guides for guiding the cable slack as neatly as possible. an inconspicuous, 24”-long cable tray big enough to hold the power strip and all excess cable lengths. All kits are available in both black and grey to blend in with your desk’s base color.